Do you have 10 minutes? You can spend that time worrying or tending to your to-do list, or you can spend that time thanking a friend or family member for their kindness or noticing the changing features on your daughter’s face. That’s the underlying premise behind much of Rachel Macy Stafford’s heartfelt and thoughtful new book, Hands Free Life: 9 Habits for Overcoming Distraction, Living Better, & Loving More. Stafford had introduced readers to some of her gentle ideas and the aha moments that had led her to greater clarity in her earlier book, Hands Free Mama. Now, she gives us more concrete and thought-provoking ideas and exercises to truly make the most of our time with family, community and ourselves. Stafford touches eloquently on a topic I’ve written about, which is that we often miss opportunities for closeness when we think only about the peak experiences, the vacations and large events. She writes, “There are moments in between life’s obligations when we are in the presence of our loved ones that can be made sacred.” These small moments–singing to the car radio, walking around the block, sharing meals, helping with music practice–offer multiple daily opportunities to be present and to experience joy. Children are naturals at this, and Stafford shares multiple wise offerings that her children say and teach by example. But we can learn, too, to turn off the distractions–whether that means literally turning off a technological device or turning off the marching thoughts in our heads–and choose to be truly present in the seemingly small, everyday moments of our lives before they drift away. The book is divided into nine chapters: “Fill the Spaces,” “Surrender Control,” “Build a Foundation,” “Take the Pressure Off,” “See What Is Good,” “Give What Matters,” “Establish Boundaries,” “Leave a Legacy” and “Change Someone’s Story”. Each of these is broken into inspiring and thought-provoking chunks, with personal stories and habit builders to help readers gain perspective, forge meaningful connections, remove judgment of ourselves and others, and be present for and attentive to the small moments that make up our days. If you have 10 minutes, you can tuck a kind note into a lunchbox, learn something new about a family member, listen to a friend without distraction, or say yes to one more bedtime story. What might you do with your 10 minutes? With your distraction-free, love-filled life? Thanksgiving presents families with wonderful opportunities to express gratitude. The traditional Thanksgiving meal offers a pause from the everyday and a rare chance to gather with the express purpose of giving thanks. But what happens when Thanksgiving is over? In the U.S., the holiday season officially begins, and with it often comes a great deal of pressure and stress. We mean well, of course. We yearn to create the perfect holiday for our families, complete with a plethora of gifts. But at what price? Gratitude? Meaning? Joy? Much of that is forgotten soon after the turkey has cooled. How do we cultivate a spirit of gratitude in our families, during the holidays and year-round, and ensure that it is not just something we proclaim during Thanksgiving? What is Gratitude and How Does it Benefit Us? It might help to take a step back to explore gratitude and its benefits. The Greater Good Science Center defines gratitude as having two components. The first is an affirmation of the gifts and benefits we have received. The second is an acknowledgement that the sources of those gifts exist outside of ourselves, that we have benefited from other people—or even higher powers, if that fits your belief system. That second part is key, say the folks at Greater Good, because its social component heightens meaningful connections with others and stimulates our circuits for pleasure and reward. It also helps with entitlement issues by reinforcing to kids that happiness is a gift from others, rather than an inherent birthright. People of all ages who practice gratitude consistently report a range of physical, psychological and social benefits, from stronger immune systems and lower blood pressure to more joy, optimism and compassion, and less loneliness. Cultivating gratitude, and the happiness that results, is a skill we can teach our children. The simple act of recording our gratitude in writing has been linked to benefits such as better sleep, fewer symptoms of illness, and more happiness for both adults and children. Have family members keep individual gratitude journals, or keep a list as a family. Write 3-5 short items weekly, naming the things you are grateful for. One exercise is to imagine what life would be like without those components. According to the Greater Good Science Center, journaling 1-2 times a week is actually more powerful than journaling daily. Focusing gratitude on people is more effective than focusing it on things. You may want to start journals on New Year’s Day and try to write in them throughout the year. Journaling won’t work for your family? Take time before or during meals to share things you are grateful for. The items can be profound or trivial. As with journaling, sharing needn’t occur every day. The important thing is that kids get into the habit of expressing gratitude regularly. Parents can model gratitude by letting other family members know that they are grateful for them and their specific actions. Mornings and bedtimes also present abundant opportunities to express gratitude. Have young children greet the day by thanking the sun for rising, the air we breathe, the beautiful trees, and their family members, teachers or neighbors. You may wish to sing a thankful “Good Morning” song (see below). Many parents use bedtime as a quiet time for cuddling and asking children to name three things they’re grateful for. Seeking another way to help kids express gratitude for others? See below for a fun gratitude craft. Studies show that play time, down time and family time are vital to kids’ and families’ well-being, benefiting every area of physical, psychological and emotional health. Children who have unstructured time and play are more creative, collaborative, flexible, self-aware and calm. Families who have unstructured time and play are joyful and close. Slowing allows families to savor the positive feelings and events that are a hallmark of gratitude. At holiday time and throughout the year, try to leave some down time in the schedule. That might mean reducing the number of activities each family member participates in, or turning down the occasional invitation. It may take practice to put the same value on “down time” that we do on organized, goal-oriented activity. It may be uncomfortable at first to be idle. If you have to schedule this time in a calendar, do so. Have you ever noticed how tourists are usually delighted? Granted, they’re on vacation together and they have come to their destination to have fun. But they also see everything with fresh eyes. Even if you’ve lived somewhere your whole life, there may be new things to see or do if you decide to do so like a tourist. This is a particularly wonderful activity and mindset for school breaks, when kids are home. As a bonus, there are often special holiday events and activities, like decorated store windows and homes, skating rinks, free music performances, and other things that are joyful, without impacting the family budget. At any time of year, you can cultivate gratitude and stimulate positive social emotions by helping your kids see daily life as an adventure. Get up early one day and visit local businesses – watch produce and eggs get delivered to markets and restaurants, see bakers bake bagels and decorate cakes. Or take a walk and stop and say hello to neighbors, shopkeepers, mail carriers and others who are on their own daily rounds. Feeling a part of the neighborhood and community are very important to children’s senses of security and feelings of gratitude. Service is a tremendously enriching act, for ourselves and for others. Studies show that people who engage in “pro-social spending” are measurably happier than those who do not. It’s not difficult to find an agency, event or individual in your area who would welcome your help, whether for one time or on an ongoing basis. Many people especially need our help over the holidays with meal preparation and delivery, toy and book drives, companionship, and other needs. Jewish Family and Children’s Services offers many volunteer opportunities for individuals and families. Instead of giving traditional gifts, consider gifting in a recipient’s name to a non-profit or other organization. Research organizations as a family and involve your kids in choosing the most worthy and meaningful to them. Have your kids cull their rooms regularly for toys and clothing that can be donated to someone less fortunate, or have kids request that birthday party guests bring new or used toys or books for donation to the charity of his/her choice, and then deliver those items together. Consider setting aside a portion of your children’s allowances or gift money and having them choose a recipient for a donation. At any time of year, and especially in winter, outdoor time tends to be low on many family’s priority lists. It shouldn’t be. Research shows that nature play has been linked to improved imagination, cooperation, academic achievement, and numerous aspects of physical and psychological health. Nature also provides a terrific setting in which to slow our paces and have new and meaningful experiences that can enhance family bonds, as well as the feelings of awe and wonder that lead to increased gratitude and inner peace. The winter solstice (December 21 this year) provides a special opportunity to slow down, count our blessings, and experience the turning of the seasons during the hectic holiday time. Mark the year’s longest night by taking a walk, preparing a special meal or having a family game night. Celebrate the sun’s return by eating oranges or hollowing out the center of an orange and placing a tealight or candle inside. If you have leftover Hanukkah gelt or other chocolate coins, place them in bags and surprise children with them. Take a family walk on December 22 to greet the return of longer days. This craft helps kids convey a special relationship and feelings in a fun, creative way. 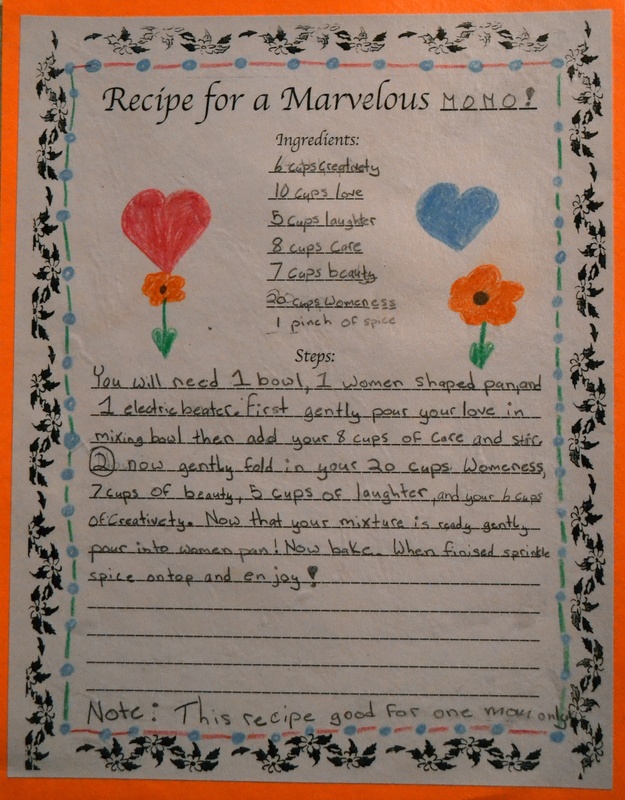 Help your child create a recipe for a “marvelous mom” or a “delightful dad” or a “fabulous friend” or any other combination using an adjective and the person’s name or role. For most families, summer is a season lasting approximately 12 weeks. Into it, we pack most of our relaxation for the year, along with our memories, our entertaining, and our sensual experiences –– whether they involve digging our toes into wet sand at the ocean’s edge or biting into a stack of mozzarella, tomato and basil, drizzled with olive oil, and swearing we can taste the Mediterranean. It’s the season when the sun kisses our faces and causes our children’s height to spurt. It’s the season of wearing less clothing; spending more time with family and friends; eating fresh, tree-ripened fruit; and spending nights playing games or gazing at stars. In summer, time moves just a little more slowly. When asked to name a childhood memory, most adults will remember an incident or a feeling from summer. While we can’t actually experience the golden season in December, there are a few fun and meaningful ways to harness the spirit of summer for our families to enjoy year-round. Many people associate the foods of summer with spots around the globe that bask in warm climates for much of the year. Think Mediterranean, Middle Eastern, African, Southeast Asian, South American, Mexican, Caribbean, Hawaiian, and regional U.S. dishes that use fresh fish, meats, cheese, vegetables, and herbs, and combine ingredients simply for results that are sensuous and robustly flavored. Cooking from warm climates is not only delicious, but can put you in a summer frame of mind any time of year. Try making Chicken Mole, Ratatouille, Easy Weeknight Fish Tacos, All Season Slaw or Pineapple Upside Down Cake. Recreate your favorite barbecue recipes that can be made in an oven or broiler. Roast marshmallows in a fireplace or over a stove flame for s’mores. A dead-of winter double feature or an all-out film festival can put your family back in a summer frame of mind. Make s’mores and watch a rustic- or camp-themed movie like The Parent Trap (original and remake), The Great Outdoors, Camp Nowhere, Meatballs or Cheaper by the Dozen 2. Show a classic summer beach or surf movie (and try to explain to your kids that bathing suits really looked like that): Beach Blanket and Gidget series, Blue Hawaii or The Endless Summer. Enjoy popcorn and a fun road-trip movie, such as It’s a Mad Mad Mad Mad World, Are We There Yet? and National Lampoon’s Vacation. Have pre-teens or teens? Show Sisterhood of the Traveling Pants, One Crazy Summer, Stand by Me or The Flamingo Kid. Some of the best moments for enjoying birds and butterflies occur during the fall, winter, and spring, even in cold climate zones. This can be when animals most need food and shelter. Watching animal activity, outside or even out a window, can brighten a gloomy day and encourage us to be better in tune with the cycles of nature, especially when we know we’re helping animals find food just when it can be hardest for them to do so. Plant a simple habitat garden with plants that attract birds and butterflies. Make and hang an easy bird feeder and watch the birds enjoy the eatery! Take a page from French gardeners and employ your own potager –– a simple, accessible kitchen garden –– all year. Many herbs do very well in small indoor containers or on a kitchen windowsill. These include basil, chives, cilantro, scented geranium, parsley, sage, rosemary, thyme, and edible flowers. You can also grow lettuce indoors. Enjoy the simple act of growing and snipping a sprig of your herbs to add to a soup, a salad or a meal. The best preserved food is made from ingredients that are picked and canned or bottled at their peak of ripeness –– To open a jar and eat a spoonful of blueberry jam in mid-winter is to taste the summer in which it was made. Even Napoleon, not known for being the world’s most sensuous guy, seemed to understand this on a gut level. After all, it was he who offered an award for the person who could invent a way of preserving food for his armies. That, in turn, led to the modern practice of “canning”, making and preserving jams and other foods to eat all year long. If you still have berries, make my favorite triple berry jam. Berries gone? Then it’s time for yummy apple butter. Jars of homemade jam make great gifts that recipients know are from your kitchen and your heart. Decorate the jars by tying on a custom gift card with a pretty ribbon. Or make a simple jar topper, which finishes a jar of jam in an especially old-fashioned and pleasing way. Instructions at the bottom of this post. Small items can have a lot of power. Did you collect sea shells, rocks, beach glass, trip souvenirs or other items? Have fun creating a display of them that you can enjoy all year long. Or make a mobile of your sea shells by poking holes into them with needles, stringing them on fishing line, and attaching the fishing line to sticks. Frame and hang a map from one of your favorite summer locales. Frame or make an album of vacation or summer photos and view them as a family on a winter’s day. Have family members share their favorite summer memories with one another. You may be surprised at everyone’s picks! Even though summer’s Perseid meteor shower tends to get all the glory, fall and winter offer some of the best star shows of the year. If conditions are right, you’ll want to bundle up, make some hot chocolate, pull up a comfortable chair, and look through binoculars, a telescope, or the good ol’ naked eye at the Geminids, or the Leonids, or enjoy the marvelous constellations year-round. My summer memories often involve playing games. There seems to be more time in summer for family play, both indoors and out. Try to keep the lightness in your family and your schedule that allows for play. Play is vital for children’s development and family bonding, and is downright fun! Try these fun playground games. In addition to warm weather, summer is often special because families approach the season with mindfulness and joy. Try unplugging or continuing to unplug earlier in the day and more often to create family time. Take walks in nature and play indoor and outdoor games, no matter the season. Keep the calendar as light as possible, even if it means saying “no” to some things or scheduling in family time. Treasure the small moments, which just may become big memories. People in India and around Southeast Asia have been drinking lassis (pronounced “luh-sees”), sweet or spicy yogurt-based drinks, for thousands of years. And, with colorful lassi stands on streets all over the subcontinent, their popularity shows no sign of letting up. For good reason. This cooling drink is great after a spicy meal or on a hot day. It works as a breakfast or a dessert. The yogurt base (traditionally a dahi, which is closer to a curd) is said to enhance digestion. And the offering of a lassi is a gesture of friendship. Yes, all this from a drink. Note: the yogurt and milk can be full-fat, no-fat, or anything in between. You can make this drink with one medium fresh mango and add ½ c. of crushed ice, if desired. You can also make a berry lassi by substituting frozen berries for the mango, or season the drink with cumin or mint. Place all ingredients except nutmeg in a blender and puree for two minutes or until the mixture is smooth and any chunks of frozen mango are fairly small. Shake nutmeg on top, if desired. Rabbit – Make a fist with one hand. Place the other palm over it and make a peace sign (for ears) with two fingers. Hawk – Link your thumbs together, with hands facing away from you. Stretch your fingers and hands and flutter them like wings. Spider – Cross your hands at the wrist. Press your thumbs together to form the spider’s head. Wiggle your fingers in a climbing motion. Wolf or Dog – Place your palms together, fingers facing away from you. Put your thumbs up to form ears. Let your pinky drop to form a mouth. Bend your index fingers to create a forehead. Camel – Lift one arm. Hold your hand in a loosely curved position. Hold the pinky and ring finger together. Hold the other two fingers together, thumb pressed in. Curve both sets of fingers and hold them wide apart to form a mouth. Your arm, from the elbow up, will be the camel’s neck. Cut a circle of fabric, approx. ¾” larger all-around than the jar band. If desired, place a dot of glue onto the top of the lid, and place the fabric onto it. Secure the fabric with a rubber band. Tie the ribbon around the rubber band to cover, and tie it into a bow. Attach a gift card or jar label, if desired. While many of us are preparing our kids to go back to school, the calendar and weather still signal summer. The days are longer, our to-do lists are less crowded. Even if you never let go of frenzy for summer, or you’re feeling it now as you gear up for fall, there are a few small shifts that can really help you lighten up to match the remaining summer season, while also helping squeeze more true pleasure from this joyous time of year. For many, summer conjures beach days, county fairs, gazing at the stars, planting flowers, playing flashlight tag, or making simple crafts. What else would you and your family really like to have done by the time Labor Day comes around? Make a summer bucket list of ideas and hang it where you can see it, or write each idea on a piece of paper or a popsicle stick and place those in a bucket. Have one family member choose an activity once or more per week for the rest of summer. Don’t feel like you have to do everything on the list – you can do many of your favorites another time. The day naturally slows when we take the time to witness a dramatic and beautiful sunrise or sunset. Get comfortable, pay attention to the changing colors and light, and make a point to either greet or say goodbye to the day. This small act can be very grounding and gratifying to people of all ages, as it truly takes us out of the artificial time of clocks, calendars, emails and to-do lists, and into the rhythms of nature and the comforting, yet awe-inspiring, turning of the Earth. Many of us are uncomfortable with empty spaces on the calendar. As difficult as it may be, and as enriching as many choices are, try to resist the urge to schedule every moment of summer. Kids actually need play time, down time and family time in order not only to recharge, but also to fully thrive. In addition, they don’t need to be constantly entertained. Free time, and even boredom, has produced wonderful innovations and insights. It is often during quiet time that many children make unique discoveries, including the directions of their own inner compasses. If down time doesn’t come naturally to you, schedule some into your calendar. This can be especially important as everyone gears up for a busier season. Have you ever noticed that kids are usually not doing and thinking about multiple things at once? This is one area in which we can probably learn from them. Many of us parents would be surprised by how much our kids just want to be with us, and how our multitasking makes them feel. In studies of hundreds of kids over five years, Dr. Sherry Turkle, director of the MIT Initiative on Technology and Self, unearthed countless stories of children feeling neglected by their parents for media. Try to compartmentalize your work and other tasks, so that they don’t invade precious time with your family. Because of the allure of electronics, we often have to turn our devices off as well, so that we can devote our attention to the people we’re with and the activities we’re doing without being distracted by alerts and the occasional itchy-fingered desire to check in with the electronic world. Electronic media is so incredibly seductive for people of all ages that sometimes we need to take things a step further and formally unplug for a period of time in order to experience our families, selves and time. Follow the direction of most of the world’s religions and cultures and call a scheduled day of rest each week, for a day, a night, or a few hours. If you’re constantly plugged in, it can be very enlightening to see what happens when you get quiet, and also when you do get back to media. It is usually emergency-free and easier to get back into the flow of work and communication than we envision. In addition, many TV shows contain anxiety-provoking images and messages. Try cutting out one or more TV shows per week and substituting them with a family walk or game. We often think we have to engage in awesome (read expensive) summer vacation travel, when sometimes the simplest experiences can prove the most delightful, especially for younger children. Get up early one day and watch the stores and businesses in your town receive their deliveries and come alive. Visit your nearest large city and partake in a true tourist activity that you’ve never done before. Walk or ride bikes as a family in a new neighborhood. You may be surprised by just how much fun everyone has, trying new things and seeing local surroundings with fresh eyes. If you have younger ones and do have time when others go back to school, that can be a great time to explore a city without the summer tourists. Summer often means extended time with your family and with that inevitably comes some days that are more trying than others. Try to keep in mind that this phase will pass, summer only comes once a year, and the kids will only be this age once. If having other parents around helps, participate in group activities, either with a buddy or through a structured program. Relish the good times and the memories you’re forming now. Chances are that summer’s smallest moments will be the ones you regard with the most fondness later. A version of this post originally appeared in Dot Complicated. These tips were adapted from Fed Up with Frenzy: Slow Parenting in a Fast-Moving World, which contains 300+ tips and fun family activities.